Definition at line 79 of file rfcnb-priv.h. Definition at line 82 of file rfcnb-priv.h. 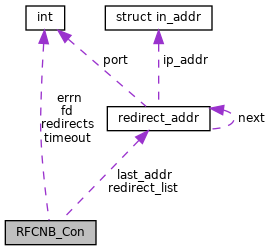 Referenced by RFCNB_Call(), and RFCNB_Put_Pkt(). Definition at line 81 of file rfcnb-priv.h. Referenced by RFCNB_Call(), RFCNB_Discard_Rest(), RFCNB_Get_Pkt(), RFCNB_Hangup(), RFCNB_Put_Pkt(), and RFCNB_Set_Sock_NoDelay(). Definition at line 86 of file rfcnb-priv.h. Definition at line 85 of file rfcnb-priv.h. Definition at line 84 of file rfcnb-priv.h. Definition at line 83 of file rfcnb-priv.h.